The title As I Opened Fire refers to the eponymous painting by the American pop artist Roy Lichtenstein. Lichtenstein based his triptych on images from a comic strip, which he presented in a more or less narrative sequence: a brief moment in an air battle. Lichtenstein emphasized the primary colors, black outlines and enlarged Benday dots that you often find in mechanical reproductions. He cared more about the image than the theme of war. “Highly emotional content, yet detached impersonal handling”, as he once described his aim as an artist. It is not as if the title of my ‘essay for orchestra’ was already there when I started composing, nor did Lichtenstein’s work determine the content or course of my music in any manner. 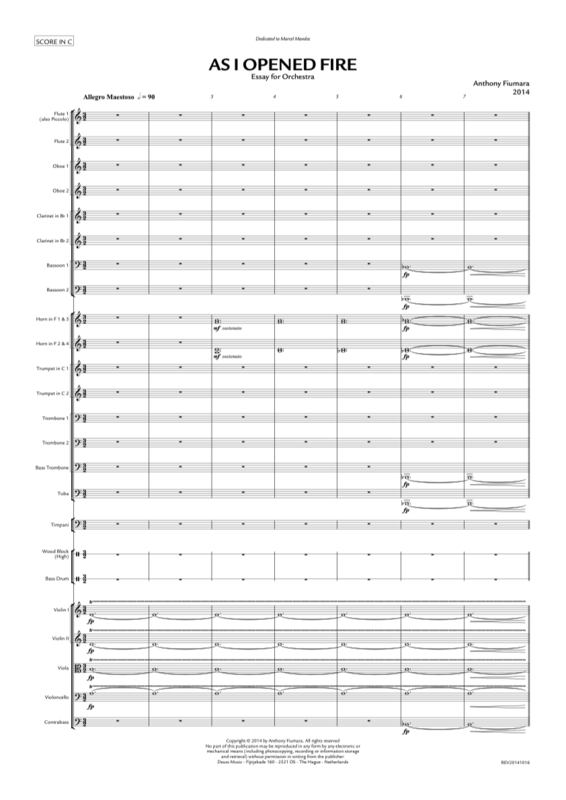 Artistic manager Marcel Mandos asked me to write a fast and exuberant work for his orchestra, which could serve as a festive overture for the opening of the renewed Theater De Lawei. While composing, the l'Homme armé melody came to mind: a martial song from the fourteenth or fifteenth century, borrowed by numerous other Renaissance composers. Miraculously, l'Homme armé fit seamlessly into the material I was working with. It became the melody on top of the horn choral, and it plays an important role at the end of the piece. The music of As I Opened Fire is one of the primary colors, black contours and enlarged Benday dots — just to stay in the cartoonish imagery. Add l'Homme armé to that and it becomes clear why I borrowed the title from Lichtenstein. Commissioned by Marcel Mandos and Noord Nederlands Orkes, for the opening of the renovated theater De Lawei in Drachten. 10 October 2014 in Oosterpoort, Groningen by Noord Nederlands Orkest, conducted by Antony Hermus.